Tag line: "TITANIC... The greatest sea drama in living memory told as it really happened!" With a budget somewhere around $200 million, James Cameron’s 1997 award-winning film Titanic recreated, in great detail, the sinking of the RMS Titanic, the British luxury liner that struck an iceberg in April of 1912 and carried some 1,500 souls down with it to its watery grave. It is a tragedy that continues to fascinate: a mammoth ship, the RMS Titanic was labeled “unsinkable” by its manufacturer, the White Star line, yet it never completed its maiden voyage, and sits, to this day, at the bottom of the North Atlantic. Packed with drama, romance, and plenty of thrills, Cameron’s Titanic took in over a billion dollars worldwide, making it one of the biggest box-office successes in cinematic history. 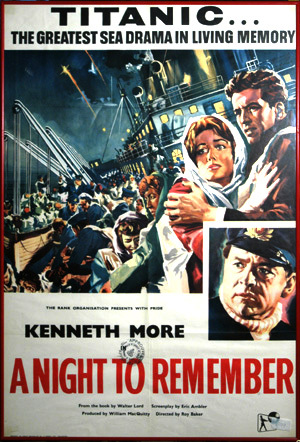 Directed by Roy Ward Baker, 1958’s A Night to Remember is another account of the Titanic tragedy. It was produced on a more modest budget (estimated to be around half a million British pounds) than the 1997 film, yet in the end is every bit as realistic, every bit as intense, and every bit as moving as Cameron’s epic undertaking. While traveling from London to New York, the RMS Titanic, the largest liner ever constructed, sideswipes an iceberg in the North Atlantic. What seemed like a near-miss soon proves catastrophic, however, when the ship’s designer Thomas Andrews (Michael Goodliffe) informs the crew that a gash in its side is flooding Titanic’s lower decks, and, in a few hours, the great vessel will sink to the bottom of the ocean. Knowing full well there aren’t enough life boats to save everyone on board, Captain Smith (Laurence Naismith) and his subordinates, including First officer Murdoch (Richard leech) and Second Officer Lightoller (Kenneth More), do what they can to get the women and children to safety, all the while hoping that a nearby ship will come to their rescue. Unfortunately, the only vessel to answer Titanic’s distress call is the RMS Carpathia, whose Captain, Arthur Rostron (Anthony Bushell), orders his crew to take whatever steps are necessary to get them to Titanic’s position as quickly as possible. But even at full-speed, the Carpathia is 4 hours away, which means a good many people will already be dead by the time help arrives. 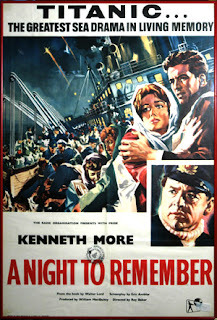 Based on Walter Lord’s non-fiction book of the same name, A Night to Remember does take some time at the beginning to introduce its various characters, most notably Second Officer Lightoller, played quite well by top-billed star Kenneth More, who spends a few days with his wife (Jane Downs) before Titanic’s maiden voyage. That said, the majority of the movie is dedicated to what transpired after the ship hit the iceberg, with events playing out as quickly as they must have that fateful night in April of 1912. Upper-class passengers, most of whom have no idea of the danger they’re in, complain about the “inconvenience” of having to put on life jackets and gather on the frigid deck. A nearby ship, the Californian (no more than 10 miles away) is oblivious to Titanic’s situation, and ignores the ship’s various SOS signals (including the distress rockets sent up every five minutes). And then there’s the passengers on Titanic's lower decks, who are locked in until the first and second classes are safely aboard the lifeboats. After seeing A Night to Remember, those who survived the disaster praised the movie’s realism, and it’s to the filmmaker’s credit that they went to such lengths to depict that terrible night as accurately as they possibly could. But A Night to Remember is far from a straightforward documentary; there’s plenty of drama as well. After a brief conversation with Thomas Andrews, first-class passenger Robbie Lucas (John Merivale), realizing how dire the situation is, calmly convinces his wife (Honor Blackman) to board one of the life boats with their three children, reassuring his family that he would follow on another boat but knowing that, in all likelihood, he would not survive. This is the first of several emotional scenes in which passengers must make that all-important decision: board the lifeboat, or stay behind (and, in all probability, die) with their loved ones. In addition, A Night to remember shows us the individual acts of bravery performed by the ship’s crew. Wireless operator Jack Phillips (Kenneth Griffith) remained at his post as long as he could to send the distress signal; and the band continued to play right up to the end, doing their damnedest to bring an air of calm to the growing panic all around them. And then there are the ship’s final moments, and the screams that those on the lifeboats could hear in the darkness. Some, including the boat carrying American millionaire Molly Brown (Tucker McQuire), returned to pick up the survivors floating in the water. Alas, many did not return. Though not as visually impressive as what Cameron and his team accomplished with 1997’s Titanic (the miniature shots in A Night to Remember of the ship at sea were lifted from a 1943 Nazi propaganda film produced by Joseph Goebbels), the story as depicted in A Night to Remember is just as powerful, and just as likely to move you to tears.